Students will use pony beads to demonstrate the advantages and disadvantages of asexual and sexual reproduction. 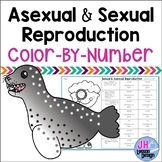 Students will classify each example as that of sexual or asexual reproduction. Leading activity for classification of organisms into the six recognized kingdoms.